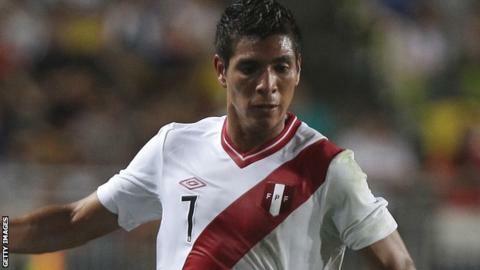 Reading have signed Peru international winger Paolo Hurtado from Portuguese club Pacos de Ferreira. The 25-year-old has agreed a three-year deal at the Madejski Stadium, subject to receiving international clearance. "He is a creative player who can play off either side of the pitch," said Reading manager Steve Clarke. "His style of play should complement the players already here and we look forward to Paolo joining our squad." Hurtado has spent three seasons at Pacos de Ferreira and helped the club qualify for the Championship League last season after they finished third in the Portuguese Primeira Liga in 2014. He was part of the Peru side which finished third in this summer's Copa America, and has also spent time at Uruguayan side Penarol. "With this summer's transfer policy, the shareholders and the board have recognised that Steve needed to be allowed space to rebuild his squad," said chief executive Nigel Howe. "Last season's points tally was not on a par with where we need to be, and with Paolo's arrival we have added another piece to the jigsaw. "The rebuilding process is always step by step, but we believe the squad is in a stronger position now and I'd like to wish Paolo the best of luck here at Reading."